As you may know, the Hospital for Sick Children, Toronto is the most favoured Paediatric subspecialty training destination worldwide. It is amongst the top three ranked Paediatric Orthopaedic Department, founded and pioneered by Dr. Robert Salter in 1963. With the advent of eminent staff physicians being stalwart of different subspecialty, it made a complete & comprehensive training for Dr. Maulin Shah. During his tenure at Sick kids, Dr. Shah could pursue a Paediatric Orthopaedic fellowship (13 months) and a Paediatric Spine fellowship (6 months). 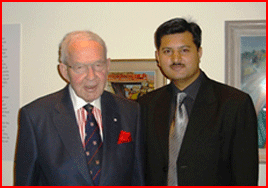 With Dr. Robert Salter, Toronto, Canada. During his fellowship tenure, Dr. Shah could learn & practice the "Sickkids Approach" to different Paediatric Hip pathologies, Paediatric foot deformities, congenital limb deficiency and Paediatric tumours. It also enabled him to learn the principles of Gait Analysis and management of patients with Cerebral Palsy. 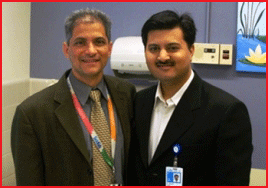 "Sickkids" being a tertiary trauma care centre, gave an unparallel experience of treating Paediatric trauma to Dr. Shah. 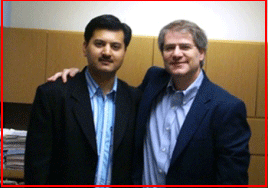 Dr. Maulin Shah had the opportunity of working with two eminent mentors, Dr. Reinhard Zeller & Dr. Stephen Lewis, during his Paediatric Spine fellowship. He could learn different approaches to Congenital spinal deformities, Idiopathic Scoliosis, Neuromuscular scoliosis and syndromic spinal abnormalities. Dr. Maulin Shah was presented the "Most Promising Paediatric Orthopaedic Fellow Award" of the Salter society at Toronto, Canada at the Salter Society meeting, May-2009. This was towards his research work on "Role of Scapular neck Osteotomy in the management of severe Glenohumeral deformity in patients with Brachial Plexus Palsy." With the further advanced knowledge and updated specialized skills of Dr. Shah, Orthokids Clinic is looking forward to offer our young patients optimum treatment guidelines. "Most Promising Pediatric Orthopedic Fellow Award"